Whether you’re planning a wedding or simply enjoying the season, many of us love summer for the same reasons: celebrations are more plentiful, warm weather encourages us to stay outside long into the night, vacations (and honeymoons!) feel mandatory, bright palettes define summer’s months, and flowers feel as though they’re blooming around every corner. Late June through late September feels glorious every year, especially for those who fight through long winters and far too much snow. Celebrate under the stars, dance in a tent or dine indoors, plan a destination soiree or one in your hometown—summer weddings never need an explanation. We’re all simply happy to embrace the season. If you’re currently planning a summer wedding (or perhaps dreaming of a summer wedding date), we thought we would share more about the flowers that can fill your centerpieces to help transform your design, no matter your fete’s style. Here, you will find 20 summer wedding centerpieces filled with in season blooms fit for a complete variety of budgets. The tail end of peony season occurs at the start of summer, so including a peony centerpiece is a must. This centerpiece by Candelaria Designs captured our eye thanks to the bold Coral Charm peonies paired with blush pink and ivory garden roses and ranunculus. Roses are in season all year long, but that still means they need to be included in our roundup of summer flowers. Here, pink roses are placed inside geometric glass and gold cases for a chic, modern look by The Flower Pail. Roses are often paired with ranunculus because both blooms share the same garden feel. In our opinion, peaches are one of the best fruits to enjoy during the summer. So, we jumped at the chance to include a peach wedding centerpiece. 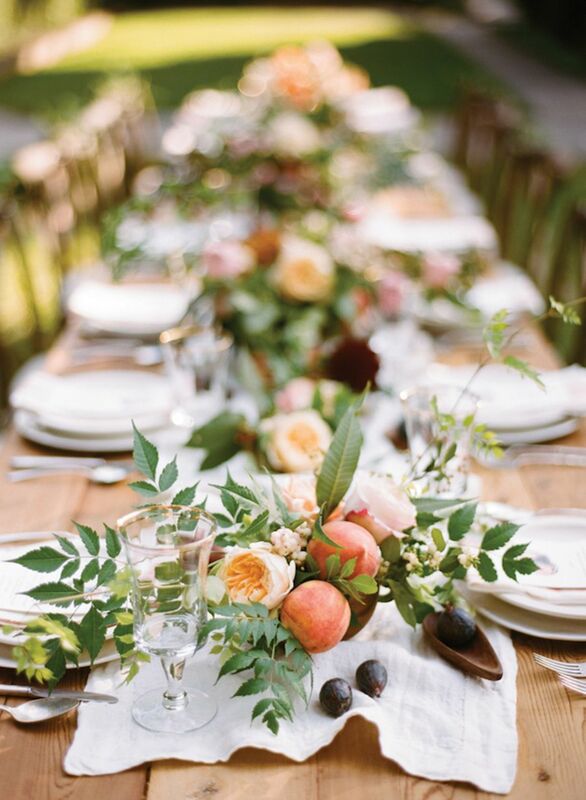 In this look, peaches are paired with garden roses, greenery, and even figs. This centerpiece by Bows + Arrows offers plenty of texture and color for a summer wedding. Orchids are in season throughout the year, and they always look particularly beautiful at weddings with tropical inspired designs. Here, magenta orchids cascade down from a tall centerpiece filled with tropical greens by Flowers by Cina. We love how the color of the flowers is picked up again in the linens. This look would be gorgeous for a destination wedding at the beach. Even if you opt to use only pops of them, bright colors feel as though they are a necessity during the summer. Garden roses are in season, and so is greenery. However, it’s the citrus included in this summer centerpiece by Emblem Flowers that catches our eye the most. Fruit adds wonderful texture and color. We have been known to mistake lisianthus for roses, and that’s due to the similar soft feel of the petals. In this neutral ivory and greenery filled centerpiece by Karen’s Garden, lisianthus is paired with roses, and we love the elegant look the design creates. We also can’t help but notice the jasmine vine peeking through on the right-hand side. Greenery is always appropriate, especially for couples who wish to take a more minimalist approach to their wedding’s design. Fox & Fig beautifully shows how Italian ruscus mixed together with candles can create a simple look that still packs a punch. Although we see hydrangea used in wedding centerpieces throughout the year, peak blooming season is actually during the summer. This in season summer flower easily transforms for any wedding’s style. Here, Revelation Design paired hydrangea with greenery and roses to create a luxurious, elegant look for a ballroom wedding at the Omni Amelia Island. This wedding could not be more fun! The couple tied the knot in the desert in Arizona, and they let their wedding’s location inspire their design. The large focal flower is a protea, which is readily available all year long, and it’s complemented by cactus. Although you might want to encourage guests not to touch your centerpieces, we do love the whimsical design by Gage Weddings. Poppies have a whimsical, airy feel about them thanks to their delicate petals. What’s even more fun is they are often featured, just as they are here, in bright palettes of yellow, orange, and red. The colors compliment summer and its warm temperatures perfectly. We also appreciate how additional greenery is used throughout the table to add an extra layer of interest to the design by Roots Floral Design. This striking modern centerpiece is filled with bright pops of yellow. The flowers that look like mini daisies are called feverfew, and the yellow, crinkley flower is called cockscomb. Succulents and branches of olive leaves are used to add shades of green. Though this centerpiece is filled with interesting florals, it’s the lemons that draw the most attention. Dahlia season starts toward the end of the summer (think: August into September), and these fluffy florals are a wonderful substitute for peonies! In fact, we may even prefer the delicate petals of dinner plate dahlias to peonies. Here, blush and ivory dahlias are paired with dusty miller to create a wonderfully soft, romantic, and feminine centerpiece for an outdoor summer wedding with flowers designed by Holly Flora. If you’re planning a wedding with a rustic, vintage, or bohemian feel, wildflower floral centerpieces can make a fabulous addition. These flowers always offer a farm-to-table feel, and here Clementine paired feverfew with thistle, greenery, and a few roses to add additional color. The bud vases are the perfect vessel. There are many different varieties of zinnias, and the look and feel can vary greatly from organic to elegant. Here, the honeycomb shape of the zinnias appears more luxurious and refined because they’re paired together with astilbe, roses, and lavender to create this in season summer wedding centerpiece. Daisies are some of the most feminine flowers, and they always look gorgeous at vintage weddings. Thanks to their budget-friendly price tag, you can easily fill centerpieces with them. And, they also look even more vintage and rustic when combined together with baby’s breath. We’re drawn to how Jasmine Flores used a pot to create this look and finalized the design with lace around the center. Lanterns are a great fixture to place in centerpieces for rustic, vintage, or garden inspired weddings. This soiree feels more rustic, thanks to the craft paper table numbers. A floral wreath of in season gerbera daisies, roses, and eucalyptus completes the look. Tip: Pairing gerbera daisies with roses offers a more elegant, refined look for a flower that is, in large part, very budget friendly. When we think of organic centerpieces, we tend to imagine designs that feature flowers in ways where they feel effortless and even as though they have simply grown the way they appear. This in season summer zinnia centerpiece by Amber Mustian matches our idea of organic perfectly. The loose arrangement also incorporates gorgeous mauve roses and plenty of greenery, but it’s the bright zinnias that draw our eye in the most. Succulents are in season year-round. Perhaps because we’re so used to watching growth occur during the summer, a succulent centerpiece feels more fitting during this season. Here, succulents are featured in pots and vessels of varying heights to add interest, and we’re also partial to the rocks included at the base. A laser cut wooden table number completes this look by Molly Taylor & Co, and it would look fantastic at a modern or whimsical celebration. Yellow is one of the happiest colors, and we think that’s because it’s so bright! A southern soiree in Charleston deserves an extra dose of joy, and this in season centerpiece of feverfew, roses, dusty miller, and lamb’s ear looks wonderful. The bright billy balls (also known as craspedia) add an extra layer of whimsical fun. When we think of in season summer flowers, sunflowers always come to mind. These bright, bold blooms are readily available and tend to be more budget friendly. Plus, this centerpiece by Lee James Floral Design showcases how well they pair with blue hydrangea and greenery.